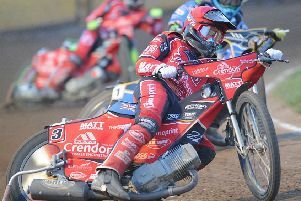 Lasse Bjerre is guesting for Peterborough Panthers on Easter Monday. Peterborough Panthers have re-sceduled their postponed Premier League Cup tie against Ipswich at the Showground for Monday (April 6, 7.30pm). The tie was supposed to take place last night (April 3), but was called off after beavy afternoon rain. Panthers now face a hectic Easter Monday as they are also at Rye House in the Cup at 2.30pm. Panthers chief Ged Rathbone is hoping for a bumper turnout for the Bank Holiday battle. Rathbone said: “We thank Ipswich for their co-operation in re-arranging our home meeting so quickly. “I’m sure a derby meeting on Easter Monday will appeal to both sets of supporters and I’m confident it will be a good occasion. “It certainly makes for a busy and exciting day as we also go to Rye House in the afternoon. Panthers will use Richard Lawson as a guest number one at Rye House with Lasse Bjerre taking over at Peterborough. Panthers were crushed 53-39 at Ipswich yesterday afternoon to make it three defeats from three cup meetings.